The blowback that Maxine Waters predicted would happen when members of the Congressional Black Caucus started criticizing President Obama is coming to bear. The blowback is coming in the form of primary challengers for their seats. Black members of Congress have spent months knocking President Barack Obama for not paying more attention to the black community. Now, Congressional Black Caucus members are themselves being charged with disloyalty — by primary challengers angry that they'd kick the president while he's down. For CBC members, it's a predicament that underscores the inherent political risks in knocking Obama, who they argue has been too quick to compromise with Capitol Hill Republicans and unwilling to pursue an agenda that would help their economically devastated districts — but who still has vast support within the black community. 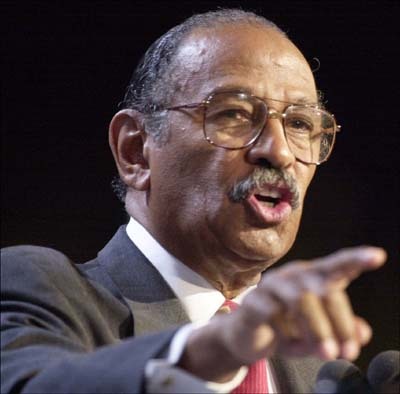 After the CBC members criticized Obama for reaching an agreement with Republicans to raise the nation's debt ceiling, Michigan Democrat Bert Johnson hammered Rep. John Conyers, the longest-serving black House member and frequent Obama critic who went so far as to call for a march on the White House in protest of the deal. "While I wish the final contents of this bill were different, turning our ire on our president, as Rep. John Conyers and a handful of his colleagues unfortunately have done, is the wrong thing to do," Johnson, a black state senator who is challenging Conyers, wrote in The Huffington Post. "We should not pull the rug out from underneath the president when he needs our solidarity the most." Johnson, an ambitious 38-year-old Detroit lawmaker, is crisscrossing the district, casting Conyers as a hard-nosed Obama enemy. "Trying to chop off the head of the president is a very destructive thing that divides us," he told POLITICO. "I just think it's been a very heavy hand some members have had toward the president, and I don't think it's been productive." Get over it, people: this man does not care about you. Now will someone be honest enough to point out a black man who has forgotten the concept of brotherhood? If black people let this one slide, they will only confirm the stereotype that "birds of a feather flock together".